Syllabus of the Online Course (Subject): ASEAN-Russia Business Forum. Indonesia, Singapore, Thailand. 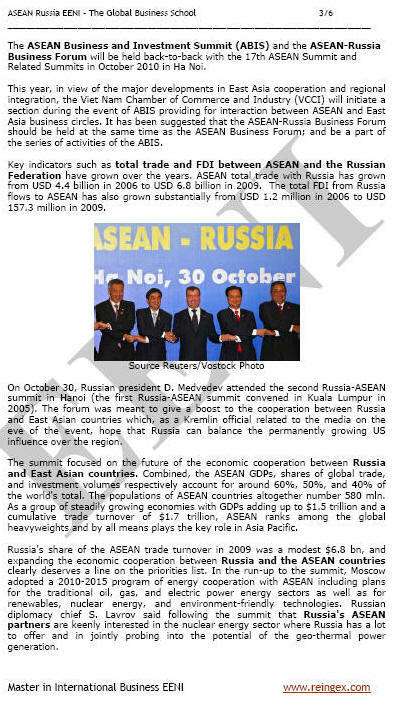 The ASEAN Trade, Business, and Investment Summit and the ASEAN-Russia Business Forum held in the 17th Summit of the Association of Southeast Asian Nations (ASEAN) in 2010 (Vietnam). Total foreign direct investment from Russia into the Association of Southeast Asian Nations region also has grown substantially from USD 1.2 million in 2006 to USD 157.3.